When our translator Yoshiko Kato visited the cemetery, she told us that two words occurred over and over again on the tombstones: mizuko and warashi. “Are those names?” I asked. “No, not names…” she said, searching her memory for an English translation. “Warashi is a child that died as a child,” she explained. Translating mizuko seemed to be a bit more of a challenge for her. “Mizuko,” she finally explained, “is a child who died before it was a child—a child who died before it was born.” I don’t think Yoshiko had been in America long enough to incorporate the word stillborn into her working vocabulary, but this is clearly what she meant. She gestured broadly to the surrounding tombstones. “Many, many stones,” she concluded sadly. Tase Sagara knew about this high mortality rate first-hand. There are two small graves in Row 6, in the oldest section of Japanese graves, where she and her husband Toshiro buried their first two children. Koshiro Sagara had been born on May 17, 1913; according to her death record, she did not live even a day (Mizuko). Takeyo Sagara’s remains lie right next to her sister’s. She died at six months of age in February of 1915 (Warashi). Koshiro and Takeyo had been the Sagaras’ first two children. The couple may have despaired that they would ever have a child who would survive to see adulthood—or even her first birthday. But, if they did have such feelings, they couldn’t afford to indulge in them for long. Tase was already pregnant with the couple’s first son at the time of baby Takeyo’s sudden death in 1915. 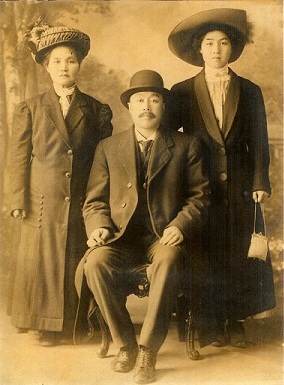 Masukichi Otsuji with his wife Miki and youngest daughter Ito. Son Hiroshi’s birth that fall would have marked a return to the happiness that surely blessed his parents’ marriage before the premature deaths of their daughters. Tase, after all, had not been one of the picture brides that came to this country to fulfill what amounted to an arranged marriage, as was common for the Issei brides of the White River Valley. She had the unusual advantage of arriving here with her parents, Masukichi and Miki Otsuji, as well as her older brother Kitaro and younger sister Ito. The whole family immigrated from Shiga-ken, Japan, to begin their life together in the United States. When Tase and Toshiro decided to marry, it would certainly have been after a more traditional courtship than merely a trans-Pacific exchange of faded snapshots. How excited they must have been to begin their lives as a married couple and start a family. Baby Hiroshi was born in 1915. In the absence of life-saving medical care or childhood inoculations, Toshiro Sagara sought less conventional means to ensure the baby’s survival. According to family descendents, Toshiro recruited a couple of friends to go through the motions of “losing” the baby under an Auburn bridge so that he could come along later and find the poor, lost little boy (in reality, baby Hiroshi was never out of sight of a caring adult while this scene was enacted). Performing this small piece of theater was, in some way, supposed to break the cycle of infant deaths—or so the legend claimed. Toshiro was certainly aware that little more than superstition lay at the root of this belief, but, after watching his first two babies die, he probably saw no harm in the performance. The scene at the bridge might not deserve the credit, but Hiroshi certainly did survive his infancy. Within a few years he was joined by a little sister, Yoneko, born in 1919. Tase’s own children were thriving, and her sister Ito had also given birth to a boy and a girl in the years between Hiroshi and Yoneko’s births. Tase and Ito, both young Issei mothers, probably drew even closer together during this period. They must have been delighted to discover that they both were expecting new babies who would arrive sometime in early 1920. Unfortunately, their happiness was not long-lived. Although Tase was a woman who had experienced dark days, nothing in her past, not even the loss of her first two daughters, could have prepared her for the sorrows that befell her during the last days of February 1920. Her sister Ito went into labor first; she gave birth to a daughter on February 17. But the baby didn’t live; she was dead at birth—mizuko. The baby was buried in Row 1 (an area of the cemetery opened to Japanese burials in 1917) of the Auburn cemetery. Tase herself might have been in labor on February 24, the day her sister Ito died, probably from complications of childbirth. Ito’s name is not listed on any tombstones in the cemetery, but her cremated remains could be interred in the same plot with her new-born daughter. The daughter Tase herself bore on February 25 was also stillborn—mizuko—and was buried right next to her cousin in Row 1. She was given the name Koshiro Sagara, after Tase and Toshiro’s first child, the older sister who had been buried in the cemetery seven years earlier. Tase’s sorrow over these devastating losses was soon compounded with the announcement from her brother-in-law Isajiro Otsuji (Ito’s husband 2) that he would be returning to Japan with his and Ito’s two surviving children: daughter Tatsue (b. 1916) and son Kinzo (b. 1918). Tase could well have envisioned these children growing up alongside her own. If so, it would have been another dream shattered as result of the infant mortality rate that had so devastated both her own family and Auburn’s Japanese community in general. There was one bright spot in Tase’s life during 1920. That summer, her older brother Kitaro returned from Japan with a new bride. Tase and her new sister-in-law Suye both gave birth to babies in 1921, both of whom survived to adulthood. 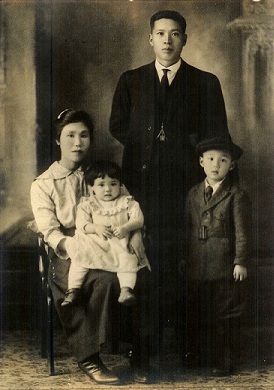 Both couples went on to have additional children, all of whom lived with just one exception: Kitaro and Suye had a son in 1928. The little boy died on September 18, 1929; he too is buried in the Auburn cemetery. Warashi. Like all of the White River Valley Japanese, the Sagara and Otsuji families were forcibly removed from their Washington homes in early 1942; they were sent to California’s desolate Tule Lake internment camp for the duration of World War II. Unlike so many families, however, several of Tase’s relatives did eventually make their way back to Washington. Tase herself died here (in Pierce County) in 1973. She and her husband Toshiro are both buried in Auburn’s Mountain View Cemetery. Younger family members remember escorting Tase to the Pioneer Cemetery in the years before her own death, to pay her respects to the children there who died so long ago. Note: Thanks to Yoshiko Kato’s translating efforts, the vast majority of the cemetery’s Kanji tombstones, including the Sagara and Otsuji stones, have been translated in whole or part. Of those identified, fully seventy percent represent burials of babies or small children. 1 * Ito, Kazuo. Issei: A History of Japanese Immigrants in North America, trans. Shinichirio Nakamura and Jean S. Gerard. Seattle: Japanese Community Service, 1973. 2 Both Ito’s maiden name and married name was Otsuji. It is unknown how she and her husband may have been related. Since there is no marker for Ito in the Auburn cemetery, it is possible her husband Isajiro returned her cremated remains to Japan when he departed for his home country with their children.